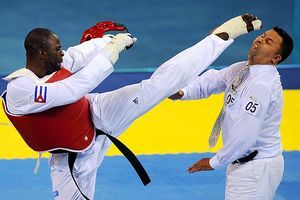 During an Olympic Taekwondo bronze-medal match, Cuba’s Angel Matos acting out in frustration, deliberately kicked a referee in the head after the athlete was disqualified. In response, the World Taekwondo Federation has recommended that he be banned for life. The head of the federation seemed very embarrassed by the incident and also called for the ban of Matos’ coach probably because he seemed unapologetic. Matos was actually winning 3-2, with 1:02 left in the second round, when he fell to the mat after being hit by his opponent, Kazakhstan’s Arman Chilmanov. Fighters get one minute for injury time, and Matos was disqualified when his time ran out and he was still sitting on the mat. Matos became angry and protested the call, pushed a judge, then shoved and kicked the referee in the head. Matos was then escorted out of the arena by security. The referee he kicked had to have stitches in his lip. Matos won a gold medal at the 2000 Sydney Games. This was the first time a match result has been overturned since Taekwondo became an official Olympic sport in 1990. Thanks to ESPN Sports’ Olympic coverage for the story.